Diggory shows regularly at the Blue Mountain Gallery in New York City. She recently had solo exhibitions that focused on her hybrid works at Fairleigh Dickinson University and Suffolk County Community College, Selden, NY. 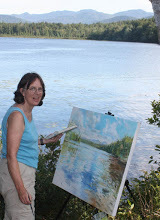 For several years she has been an artist-in-residence at the Adirondack Museum in Blue Mountain Lake, NY, painting on the grounds of the museum during one week of the summer. Her work is part of many private and public collections including The Hyde Collection in Glens Falls NY, the Yale Art Gallery, Siena College, DePauw University, Blue Shield of NE New York, and Bessemer Trust in San Francisco. 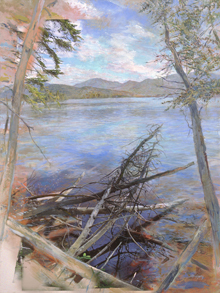 Major commissions include an Adirondack scene for the new Upstate Cancer Center in Syracuse and several large murals for The Adirondack Trust Company in Saratoga Springs. Public art works include a collaborative commission of art work for the Saratoga Springs Train Station and a large interactive artwork series for the Albany Institute of History and Art. Artist Statement: I keep making art because it’s the way that I engage with the world around me, using my sensitivity to visual detail along with my physical, intellectual and emotional energy. I enjoy the handling of materials and the creation of forms that emerge and dissolve on the flat surface. I enjoy the process – with its inherent anxieties — of making those visual elements serve a larger idea or impulse. Much of my current work is inspired by locations that include moving water, dramatic landforms, changing skies and shifting light. I like to find shapes and relationships and then manipulate them to convey what I experience in those locations as well as the sometimes unsettling experience of struggling to understand the visual complexities. The finished works often have an all-over composition in which all parts are given equal attention and the viewer’s eyes are free to wander the surface. That structural preference grows out of my early influences — Cézanne, the Cubists and the Abstract Expressionists – as well as a personal preference for messy vitality. Recently I have been intrigued by more open, uncluttered spaces such as at the seashore or lakeshore.